"Antelope" is an umbrella term for 91 species of deerlike mammals in the taxonomic order Cetartiodactyla. All antelopes have permanent horns and hooves with either two or four toes. Antelopes are ruminants -- herbivores with four-chambered stomachs that enable them to swallow plant matter quickly and regurgitate it later as cud for more thorough chewing. Most antelope species are found in Africa, and a few are native to Eurasia. Antelopes range greatly in size. The male giant eland of West and Central Africa is up to 6 feet tall at the shoulder and weighs as much as 2,000 pounds. Dwarf antelopes of the taxonomic tribe Neotragini include the most diminutive antelope: the royal antelope of West Africa's rain forests. It is no more than 19 inches long, about 1 foot tall at the shoulder, and less than 5 pounds. 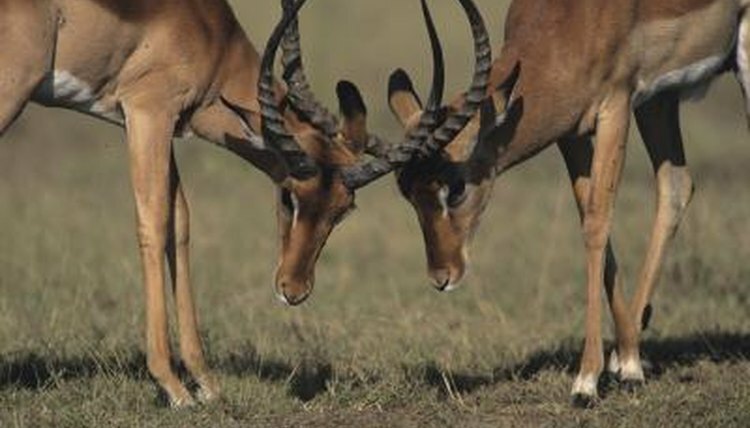 A universal feature of male antelopes is a pair of permanent horns used to fend off predators and establish dominance among members of the same species. In approximately two-thirds of antelope species, females also have horns, albeit shorter and slimmer than those of their male counterparts. Antelope horns come in a variety of shapes and sizes. Nine species, including elands, kudus, bongos and nyalas, have spiraled horns. The three species of oryx have long, thin horns that are relatively straight. The horns of the wildebeest are curved and pointed, and those of the impala and sable antelope have screwlike ridges. All antelopes have hooves, the shape and size of which reflect each species' ecological needs. The addax antelope of Northern Africa's deserts, for example, has wide hooves with flat undersides, which keeps these endangered animals from sinking into sand. In the wetland-dwelling situtanga, elongated and widely splayed hooves prevent the animal from slipping when she treads on mud. The hooves of the klipspringer, a dwarf antelope, are small and rounded with a rubbery center that lets the animal maintain his footing on rocky terrain. Antelopes come in multiple shades of brown and gray ranging from beige to black. Many species have light and dark markings on the face and the body. Some species are sexually dimorphic in color. Male sable antelope, for example, have black coats with white underbellies, while females are chestnut-colored. The coats of addax antelopes transitions from gray-brown in the winter to a creamy shade in the summer, which helps regulate body temperature. Antelopes who live in closed habitats often rely on camouflage to avoid being eaten. A reddish coat makes the bongo, the largest forest antelope, imperceptible in low light. White vertical torso stripes help distort the animal's shape in the eyes of predators.